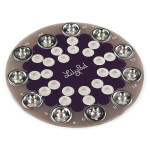 This is a simple pack of five Red LilyPad LEDs that are still attached to one another, letting you s.. 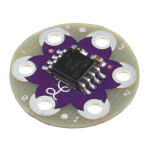 The LilyTwinkle is a tiny little LilyPad board designed to add some twinkle to your project. Even th.. This is a small buzzer for the LilyPad system. Use 2 I/O pins on the LilyPad main board and create d.. This is a simple pack of five Green LilyPad LEDs that are still attached to one another, letting you.. When you're working with e-textiles, you have a tendency to collect a lot of small parts: LilyPad bo.. 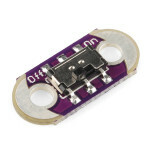 This is a simple to use light sensor that outputs an analog value from 0 to 5V. 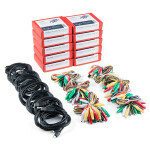 With exposure to day..
ChickTech's Soft Circuits Kit is a fun combination of electronics, software, and art! Using the mate.. This is the E-textile Basics Lab Pack, a basic wearables learning kit that can easily get you and a ..
Are you looking for a fun and simple e-textiles project? 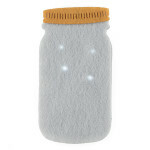 The Firefly Jar Kit is a great project for .. This is the LilyPad Arduino Simple Board. It's controlled by an ATmega328 with the Arduino bootloade.. The LilyPad SimpleSnap is a new, easy way to create e-textiles projects with LilyPad that are modula.. This is the LilyPad Arduino USB board, controlled by an ATmega32U4 with the Arduino bootloader. It h.. 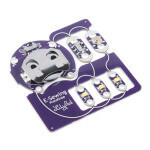 The LilyPad E-Sewing ProtoSnap is a great way to explore how buttons and switches behave in simple e.. 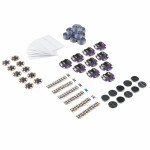 This is a simple pack of five Blue LilyPad LEDs that are still attached to one another, letting you .. 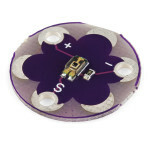 This is a simple pack of five Pink LilyPad LEDs that are still attached to one another, letting you .. This is a simple pack of five Yellow LilyPad LEDs that are still attached to one another, letting yo.. 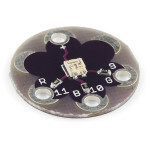 The LilyPad Light Sensor is a sewable breakout board with an ALS-PT19 light sensor built in and read.. The LilyMini ProtoSnap is a great way to get started learning about creating interactive e-textile c..
We know you love adding color to your e-textiles, adding the LilyPad Pixel Board to your project wil.. This is a small board for prototyping through-hole components with the LilyPad system. There are an .. 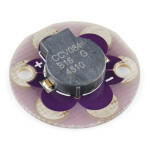 The ProtoSnap series is a new way to prototype your project without a breadboard. Everything is wire.. The LilyPad ProtoSnap Plus is a sewable electronics prototyping board that you can use to explore ci.. The LilyPad ProtoSnap Plus Kit is an all-in-one e-textile prototyping kit that has been specifically.. The LilyPad Sewable Electronics Kit lets you explore the wonderful world of electronic sewing (e-sew.. 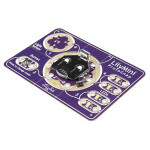 The full-color LilyPad Sewable Electronics Kit Guidebook contains step-by-step instructions for crea.. The LilyPad Simple Power is a simple e-textile board with a 500mA charge rate that lets you connect .. 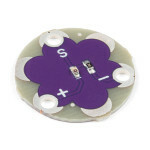 The LilyPad SimpleSnap Protoboard is a new, easy way to create e-textiles projects with LilyPad that.. This is a simple slide switch for the LilyPad. Use it as a simple ON/OFF switch, or to control LEDs,..
Blink any color you need! 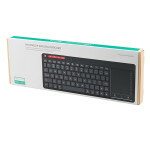 Use the Tri-Color LED board as a simple indicator, or by pulsing the red, ..